In 1995 I arrived on a point in my career where I had to make an important decision. Would I become a (financial) specialist or a generalist? During a training of Nijenrode and de Baak it became clear to me that I had a big potential (to develop) in the way of people skills and executive abilities. I decided to develop myself directed and I could let that happen by making use of a network marketing concept. In the next years I combined several management positions at several multinationals with a continuous study of success and success strategies. I read hundreds of books, listened to just as many tapes and CD’s and attended more than 100 seminars in The Netherlands and abroad. The combination of practice and study made it possible for me to build up teams that realized great successes time after time. In June 2002 I attended for the first time a live seminar of Anthony Robbins. In the meantime I had seen to work many speakers and trainers. Anthony Robbins however rose and rises above the others for miles. The weekend seminar “Unleash the Power Within” literally transformed my life. As soon as we speak or meet each other in person, I will explain it to you with pleasure. In the years after 2002 I decided to take friends and acquaintances with me to the seminars of Anthony Robbins to let them too experience this. As a result of the overwhelming enthusiasm and the special breakthroughs that they too realized, it became clear to me that my path of life would be in line with this. It became clearer and clearer that only we ourselves set the limits of our own potential and that everyone can put up a tremendous performance in every area of life. In September 2006 I met Vincent van Gaasbeek and soon it became clear that our vision had great similarities and shortly after we decided to cooperate. 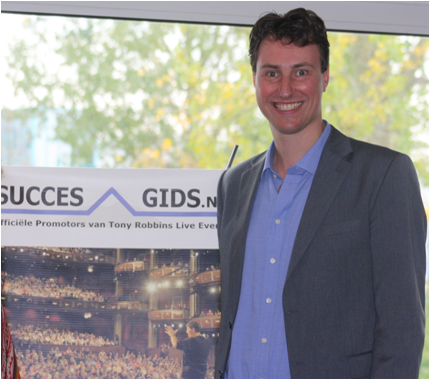 After the time my former “network marketing” business partner Arnout van der Swaluw had attended the seminars of Anthony Robbins, the three of us decided to start SUCCESGIDS and IFDA (Interactive Financial Destiny Academy). Due to the fact that I, preceding the start of the companies, had made a commitment to multinational Group 4 Securicor (G4S), I combined a management position at G4S with my passion during more than a year. Since January 2008 I am fully focussed on SUCCESGIDS and IFDA, with enthusiasm and plenty of energy. It is good to see that the participants of the seminars, workshops and coaching courses share our enthusiasm and tell the people in their surroundings about it. It makes me feel that we are at the start of a beautiful development with which many people can lift their lives to a higher level.